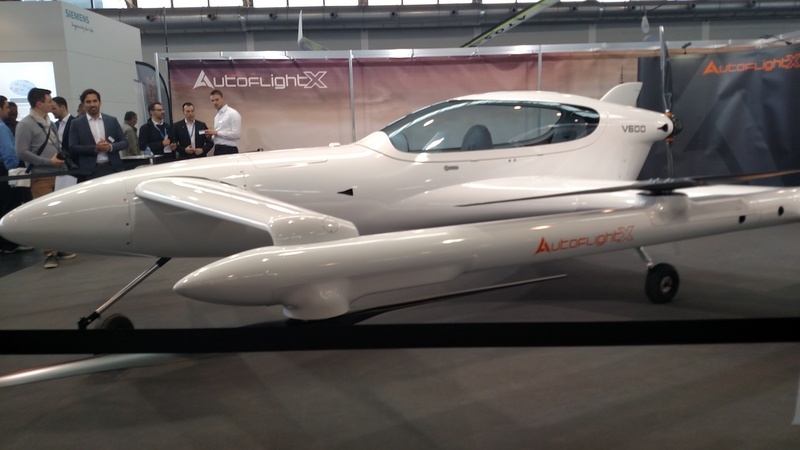 To fly shortly, the AutoFlightX V600 technology demonstrator was designed to meet the new EASA 600-kg ultralight threshold. German startup AutoFlightX today unveiled an all-electric technical demonstrator, the V600, that will pave the way for a future certified eVTOL used in air-taxi and cargo operations. Founded in 2018 by Tian Yu, formerly of Yuneec International Electric Aviation, AutoFlightX first developed a two-place vehicle that can be qualified under EASA’s new 600-kg threshold for ultralights. The two-place vehicle on display this week at Aero Friedrichshafen 2019 is driven by six electric motors powering as many propellers for vertical lift capability and then another for a seventh push-propeller for forward flight. The company said its separated hover and wing flight propulsion systems are designed to build in robustness and reliability. AutoFlightX control systems modeling and simulation specialist Michael Krenmayr, however, said the final vehicle—not yet publically revealed—will carry three to five passengers and incorporate changes, such as the position of propellers, to meet EASA certification requirements. The demonstrator rolled out a few weeks ago and plans call for it to fly in the upcoming weeks, Krenmayr said. It will be tested for conventional flight before moving into vertical lift and hover testing. This testing will enable the company to prove the concept and safety of systems—many of which are commercial of the shelf components—before moving forward with the final configuration. Long term, AutoFlightX is generally targeting having its eVTOL ready for cargo flight in roughly 2023 with passenger air-taxi configuration following a few years later. For regulatory reasons, AutoFlight envisions its initial air taxis will be manned aircraft, Krenmayr added.